Collective Intelligence or just digital graffitti? Google just turned up the volume of the web a notch, with the launch of Sidewiki for Google Toolbar. Activating Sidewiki allows Google Toolbar users to annotate any website for other Toolbar users with text and links. An arrow icon opens up a sidebar letting you view other people's comments, or write and edit your own, with about five comments appearing at a time. A small drop-down menu lets you share your comments via email and IM, or post a link direct to Facebook and Twitter. Subsequent visitors can rate each comment, so that the most useful comments float to the top. Google hopes that by making web browsing more interactive, everyone's online experience will be improved - a process it calls 'collective intelligence'. "Many people visiting websites have knowledge, opinions or experiences that could greatly enhance the experience of future visitors to that website," said Tom Stocky, director of product management at Google. "By adding an interactive element to the experience of viewing a webpage, Sidewiki has the power to increase information sharing online and enhance people's overall web experience." A quick look at the Google home page shows that people are already using Sidewiki, including a predictable selection of Google execs, marketeers and bloggers. Will Sidewiki become a valuable tool for improving web pages, or degenerate into virtual graffiti, name-calling and spam? Why not Sidewiki this page to tell us! 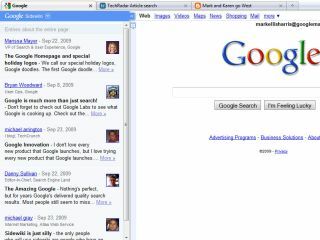 You can download Google Toolbar with Sidewiki at www.google.com/toolbar.